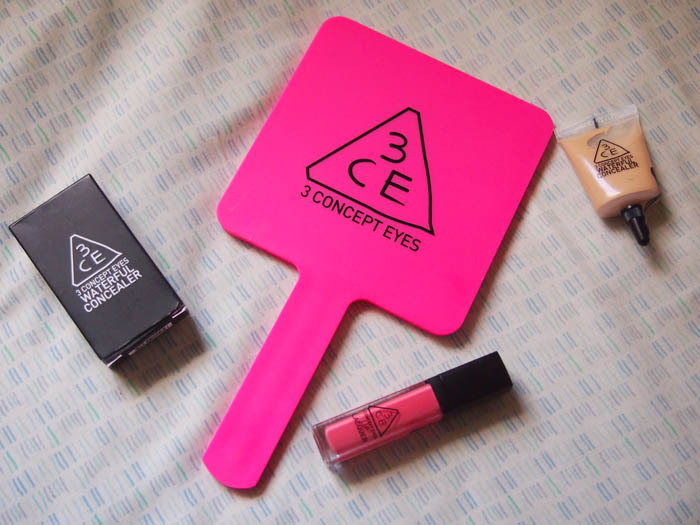 3CE has their packaging and presentation on point. I love the sleek, minimalistic range with its professional look. Yes, it does remind me of M.A.C though I did not get the appeal to either 3CE or M.A.C for a long, long time. My taste in makeup has finally moved from teenager to early-mid twenties and suddenly everything about 3CE looked cool. It also helps that they have gorgeous models to promote their items: from makeup to clothes. I am not as much into fashion as into makeup and skincare, so their clothing advertising hasn't won me over yet (thank goodness- otherwise I would be spending more money). Here are the few things I have from their line. Currently, I have three items from 3CE. Overall, I think the two makeup items I have are overhyped. As I mentioned in my review of the Lip Lacquer, the product is so drying, patchy, and does nothing for my lips. Of course, different colours in the line are likely to perform differently but I was sorely disappointed by Super Coral. Christina recommended me the Waterful Concealer but she mainly uses concealer to cover up her dark circles and I use concealer to cover up blemishes. The concealer does live up to its name, but I am sure there are better concealers out there for a better price. It does a decent job at covering up under eye circles, but looks dry as heck on blemishes. BB cream does a better job in my opinion. The mirror is good quality and I am glad I purchased it. I got it as a reward to myself (lol) after finishing a contract position at a consulting firm. I purchased it at MD Ranking for around 12.50AUD. What is your impression of 3CE?